During the winter season, people around the world celebrate holidays with a variety of traditions, including exchanging gifts, decorating Christmas trees, or lighting menorahs. But did you know that many of these traditions, including stocking stuffing and gelt giving, involve coins? 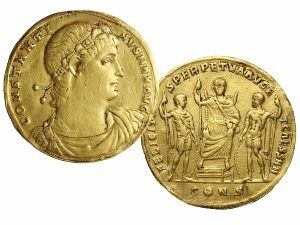 A gold medallion from the reign of Constantine I, which sold at auction in 2015 for $198,000. Photo courtesy of Bonhams. For over two thousand years, people have been celebrating Christmas. When you think of Christmas today, images of jolly Santa Claus in a big red suit, Mrs. Claus, elves, and reindeer come to mind. But few people know the history behind the Christmas tradition of Saint Nicholas. The real Saint Nicholas was a Christian bishop that lived in the fourth century A.D. in Myra (a city in modern-day Turkey). He was known for his generosity towards children and the poor. One of the most famous stories about St. Nicholas dates to 330 A.D. St. Nicholas helped save three girls from poverty by tossing gold coins through the family’s window at night. The coins landed in stockings, which were hanging by the fire to dry. This started the tradition of Santa secretly putting gifts in stockings. We do not know the type of coin that St. Nicholas would have used. But, given the time period, the coins would likely have been Roman with the image of Emperor Constantine pressed on it. Chocolate gelt, covered in gold foil wrapping for Hanukkah. Like Christmas, Hanukkah is also celebrated during the winter season. The Jewish holiday is believed to celebrate the victory of the Maccabees over the ancient Greeks. Common Hanukkah traditions include lighting of candles on the menorah and playing dreidel, a spinning top game. 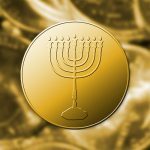 One very common Hanukkah tradition is exchanging chocolate gelt, or foil-wrapped chocolate coins. Gelt, before it became associated with chocolate, originally referred to small amounts of money gifted from parents to children, or among friends. In the 1920s, American candy makers began making gold- and silver-wrapped chocolate versions of the coins, which are commonly used today. While Christmas Day is an observed federal holiday, conflict did not always stop. Some important events in history took place during Christmas, including a turning point for the Revolutionary War. On December 25th, General George Washington crossed the frigid Delaware River to surprise attack the Hessians, or German troops hired by the British. The battle is known as the Battle of Trenton, and marks the first of two victories by the Continental Army to regain control of New Jersey. 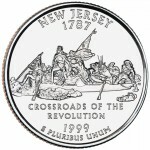 Check out the New Jersey state quarter, part of the 50 State Quarters Collection, that depicts General Washington crossing the Delaware River on Christmas Eve in 1776. Can’t get enough holiday cheer? Try our holiday-themed Word Quest game. Find key words that describe holiday traditions celebrated around the world and in the United States.